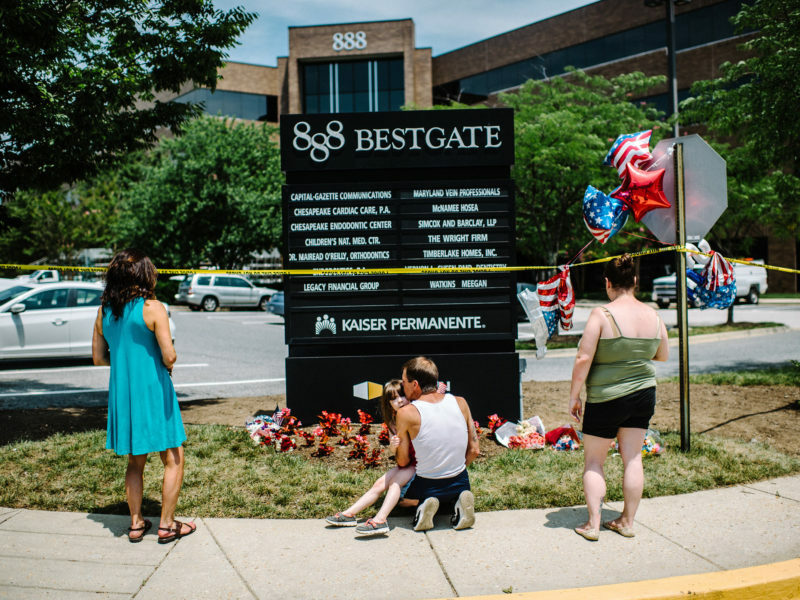 I knew I was getting close because Google Maps displayed a red bull’s-eye with “Annapolis shooting” instead of the actual address, 888 Bestgate Road, Annapolis, Md. 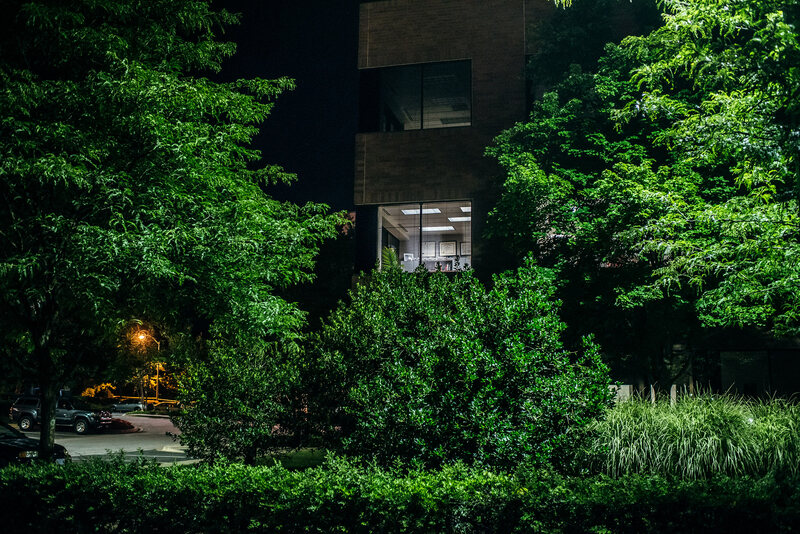 In between a TD Bank and the Annapolis Plaza Shopping Center, Google had locked in my location like it was some sort of amusement park. 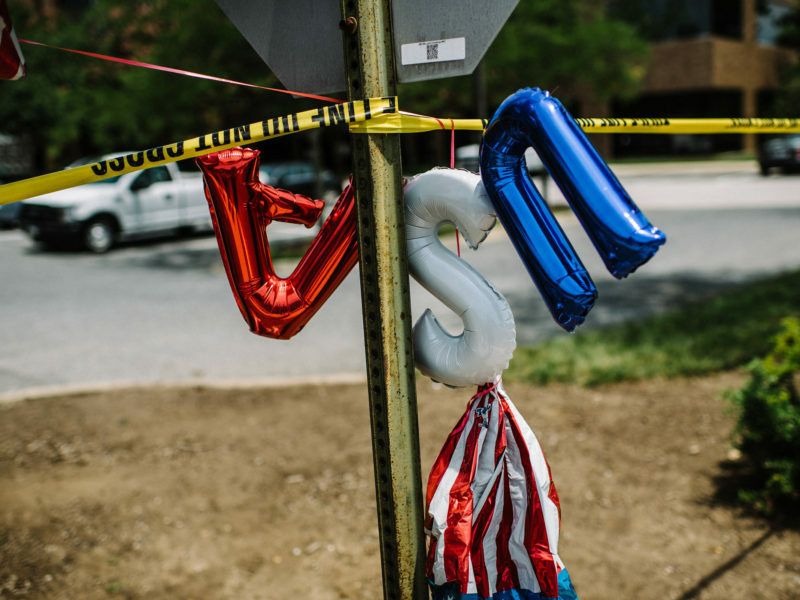 In fact, I had arrived at the scene of America’s 154th mass shooting this year. 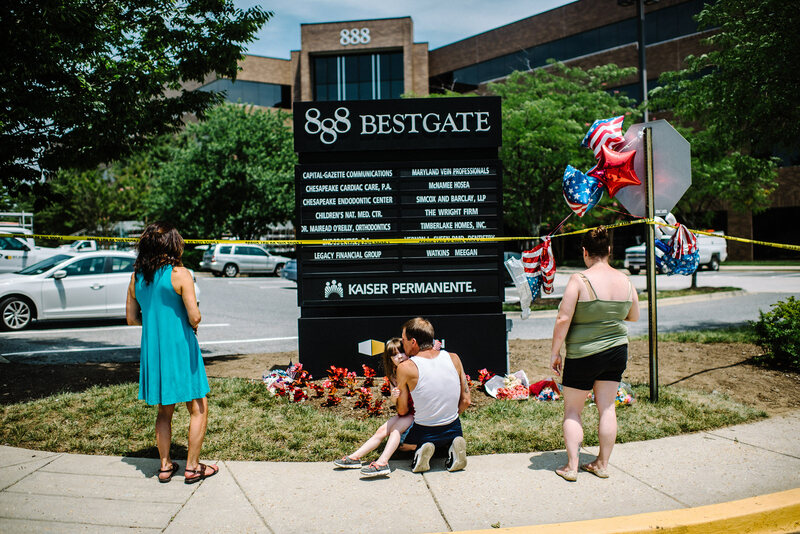 I parked in front of a Pottery Barn that would be the meeting point for a vigil later that evening, and walked toward the offices of The Capital Gazette, the site of last week’s shooting that killed five people, passing long rows of news vans and satellites. The wretched reality is that we all know this place. 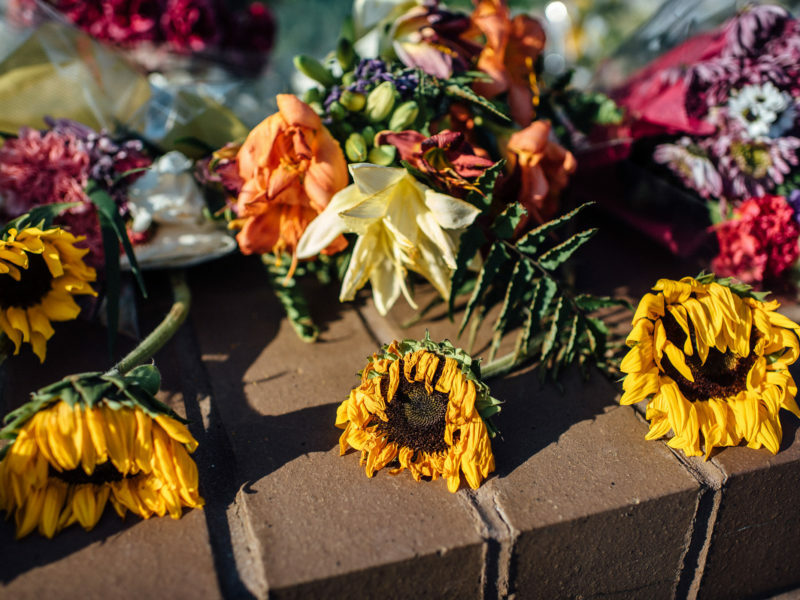 The imagery produced in response to mass shootings is so ubiquitous that it has almost become a guideline for how to process this type of American violence: police tape, crime scene, shooter’s home, press conference, candlelight vigil, mourners, flowers, crosses, signs. 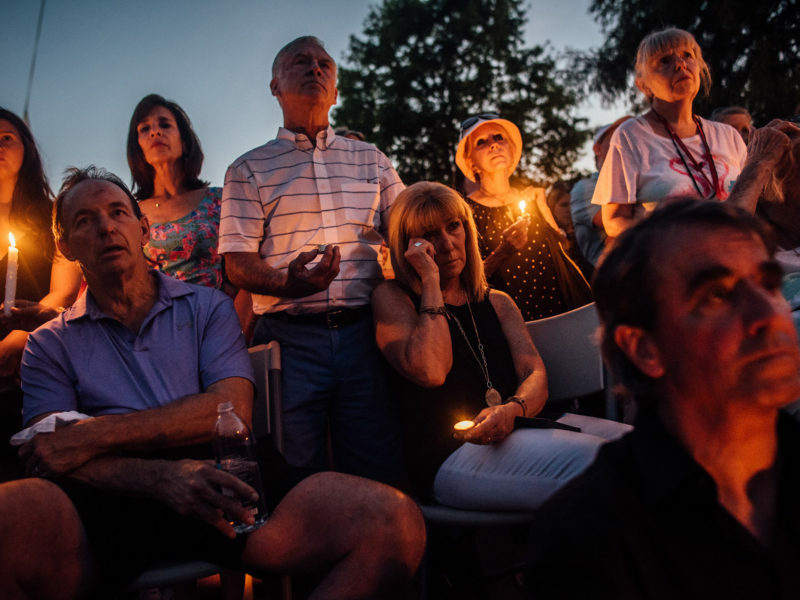 The cycle is so frequent that it maintains the illusion that these individual shootings are somehow all part of the same event — that they’re chapters of a long, terrible novel. 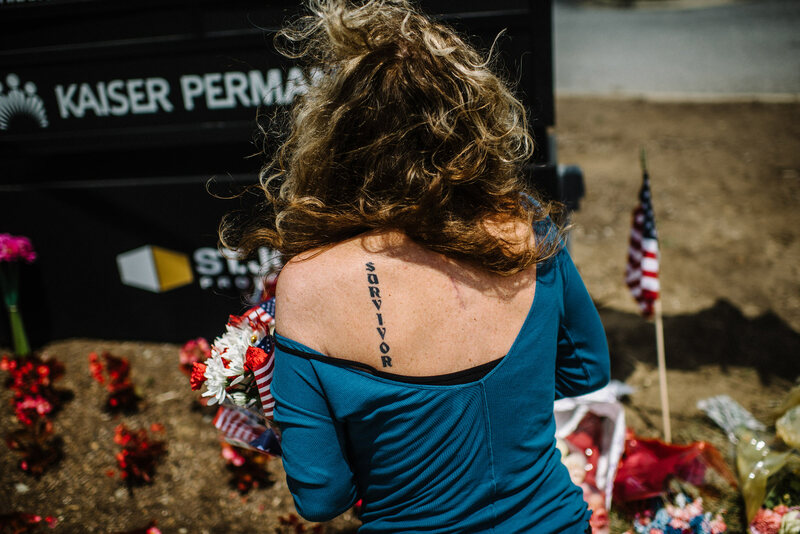 In a way, they are connected, because they are the symptoms of a violent nation. 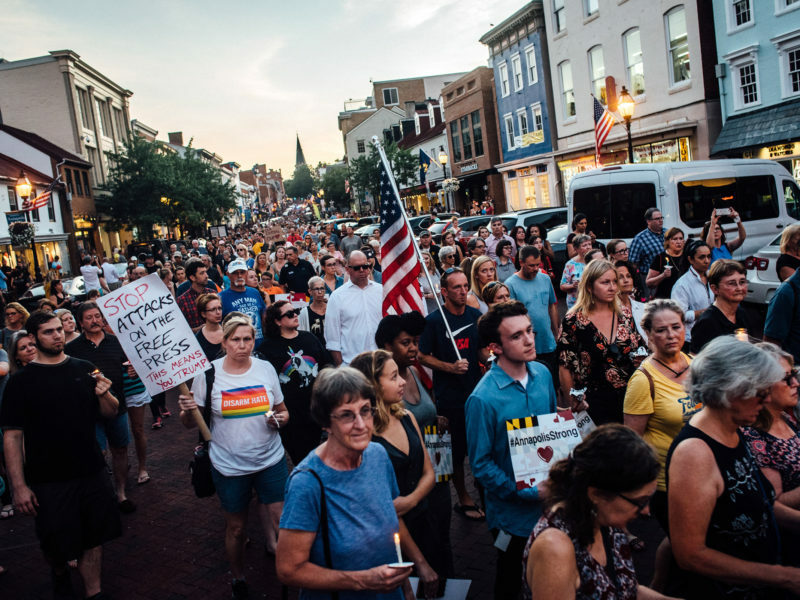 All we have to do is list cities with no other context, and we understand what they signify: Annapolis, Aurora, Newtown, Orlando, Sutherland Springs, Las Vegas, Charleston, Parkland. 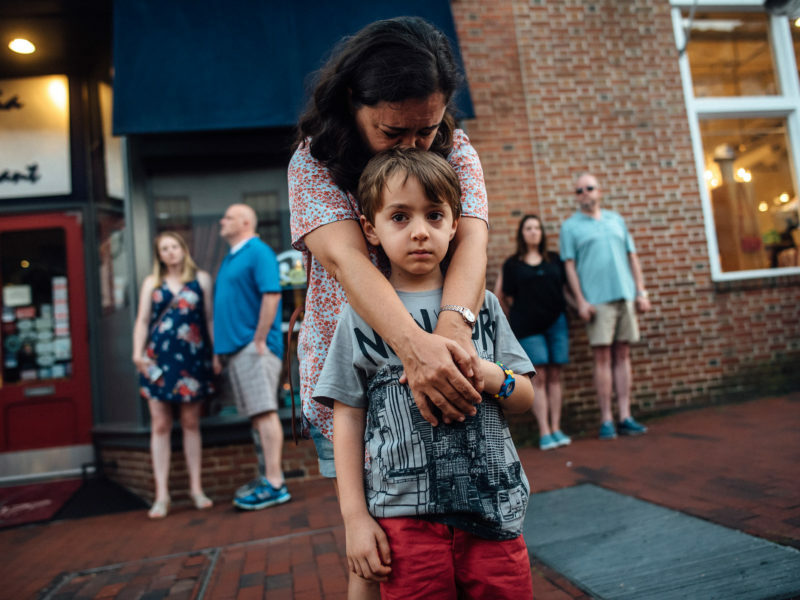 But to look at these shootings simply as a monolith is to strip the individual pain that these affected communities feel on local, personal, and family levels. 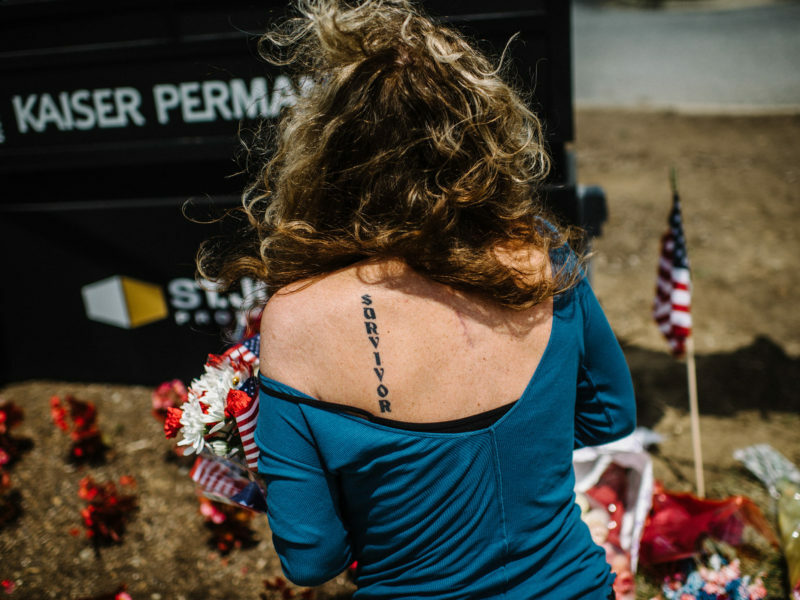 “It’s just too much,” a woman said at the home of Jarrod Ramos, the alleged shooter, after honking at me from her car. “I can’t handle it anymore. 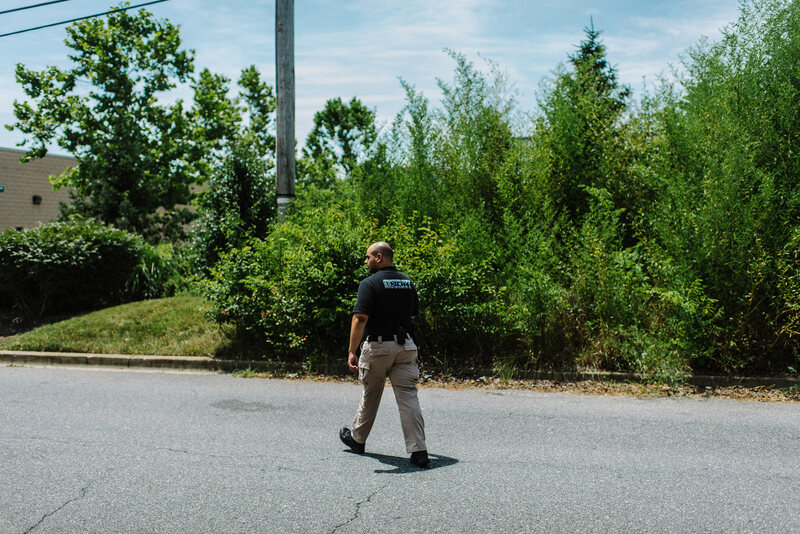 I know you have your job to do, but my family lives here.” It was the first time in my career I felt like a vulture. I apologized and told her I wish I didn’t have to be there, then she pointed out that I was standing in Mr. Ramos’ parking spot. She let me take a quick picture. I apologized twice more, then drove away. 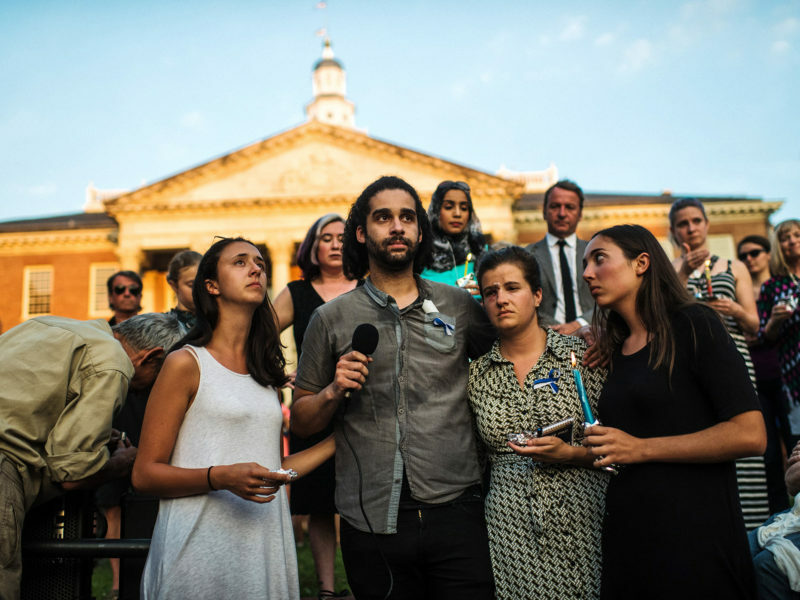 Now, a week after the shooting, Americans are uncomfortably holding our collective breaths until this happens again. 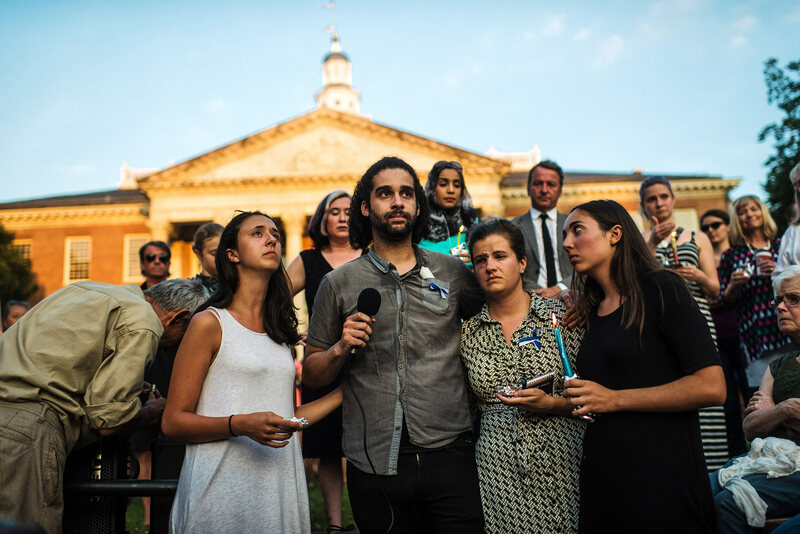 We hope it won’t but we know it will, and once it does we will again mobilize with the swift fortitude of it Just Being the Way Things Are Here. 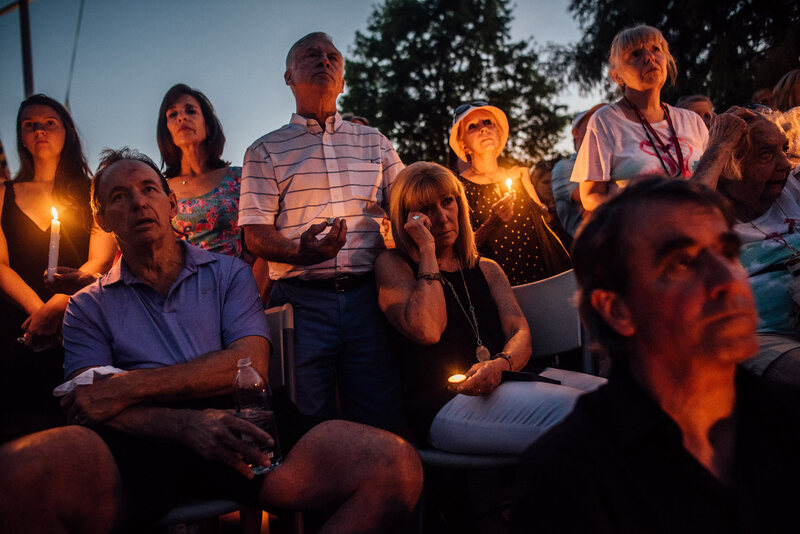 We will make the same pictures, ask the same questions, have the same political arguments, show the same police tape, and wait in our purgatory for it to happen again and again and again. For all eternity, Sisyphus was made to roll a giant boulder up a mountain, only for it to roll back down when he had nearly reached the top. As Americans, will we keep rolling this boulder back up the mountain every week, every month and every year, forever? 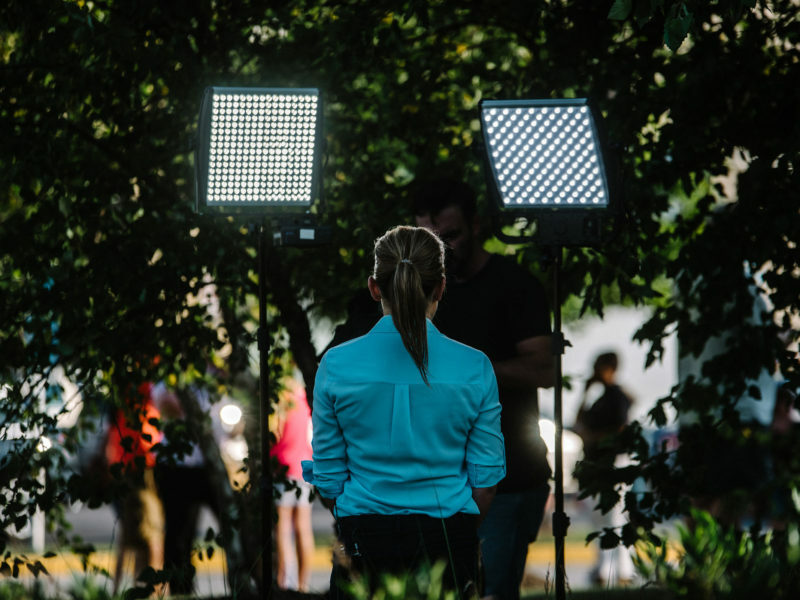 As a journalist all I can do is present these days as they unfold, with the honesty, compassion and sensitivity that the treatment of a suffering community requires. 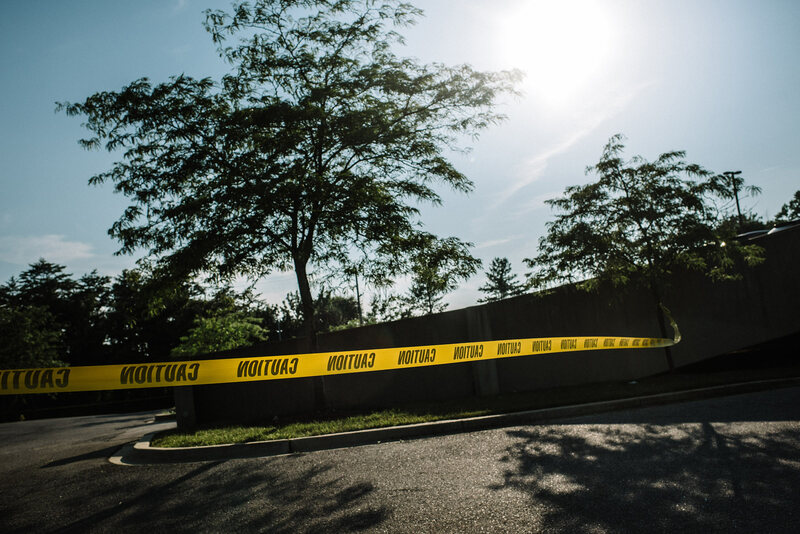 As I left the Capital Gazette offices on Sunday afternoon, three days after the shooting, the news vans were gone, and police tape was scattered along the concrete like ribbon. 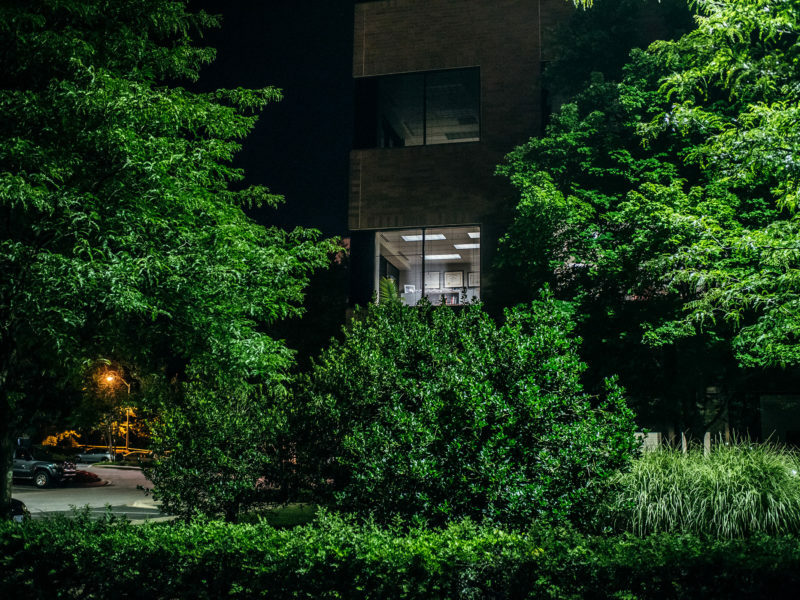 I opened Google Maps to find my way home and my blue dot pulsed at 888 Bestgate Road, but the bull’s-eye had disappeared, and the previous declaration of “Annapolis shooting” was gone. 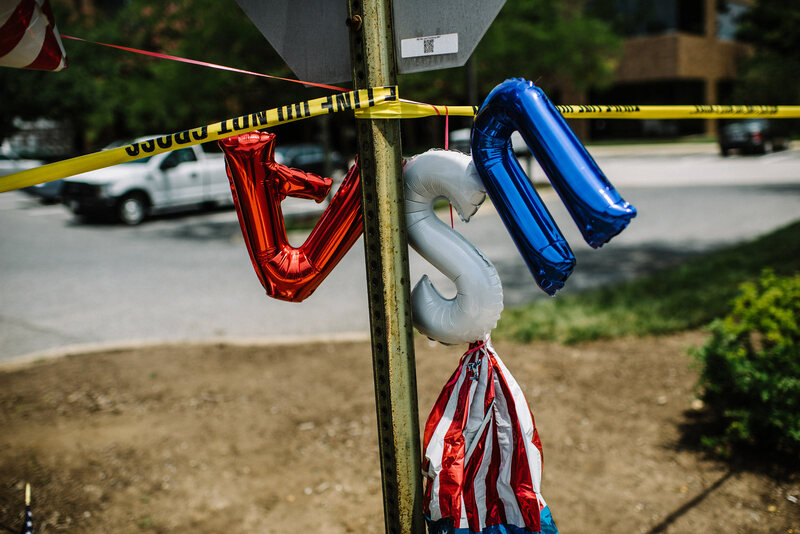 Balloons and police tape in front of the Capital Gazette in Annapolis, Maryland. 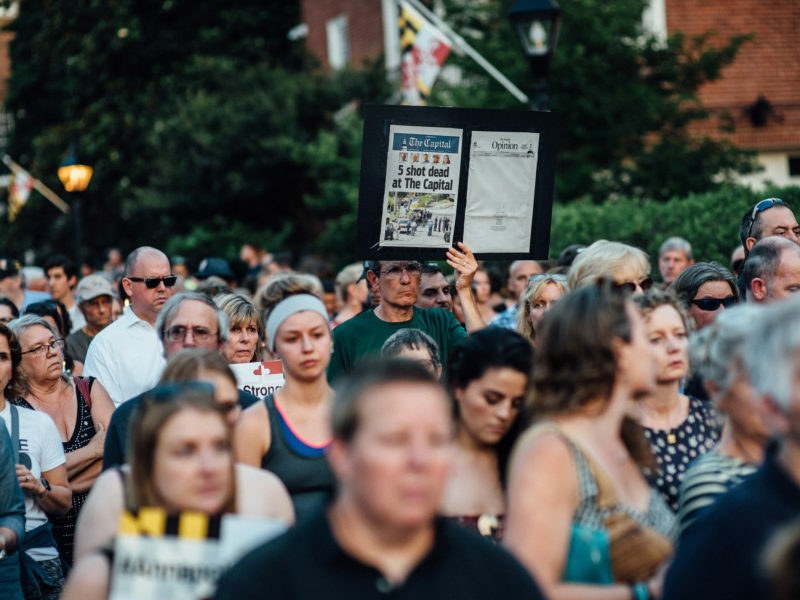 Starr Dyer, sitting center, at a vigil held in the honor of the people killed at the Capital Gazette in Annapolis, Maryland. 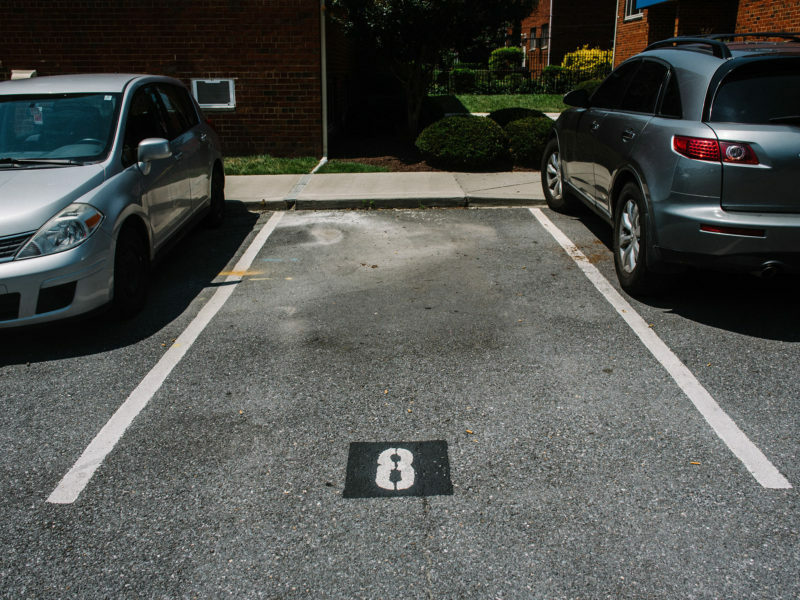 The back parking lot of he Capital Gazette in Annapolis, Maryland. 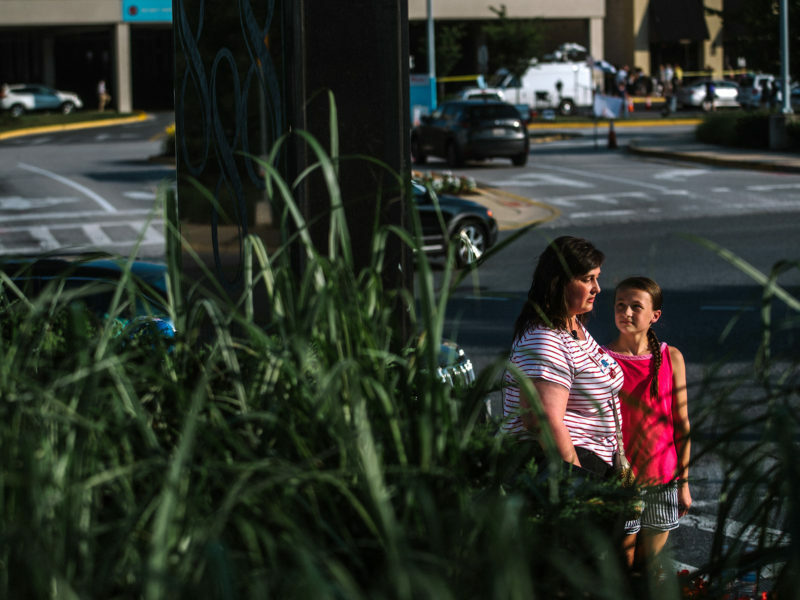 JoAnn Merritt-Green puts flowers down at a memorial in front of the Capital Gazette. 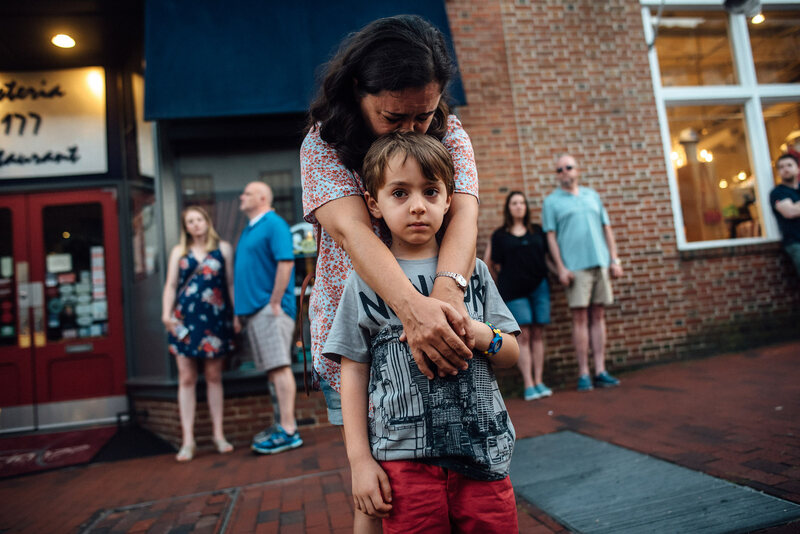 Carina Hutzler and her son, Felipe, 5, watch the vigil in Downtown Annapolis. 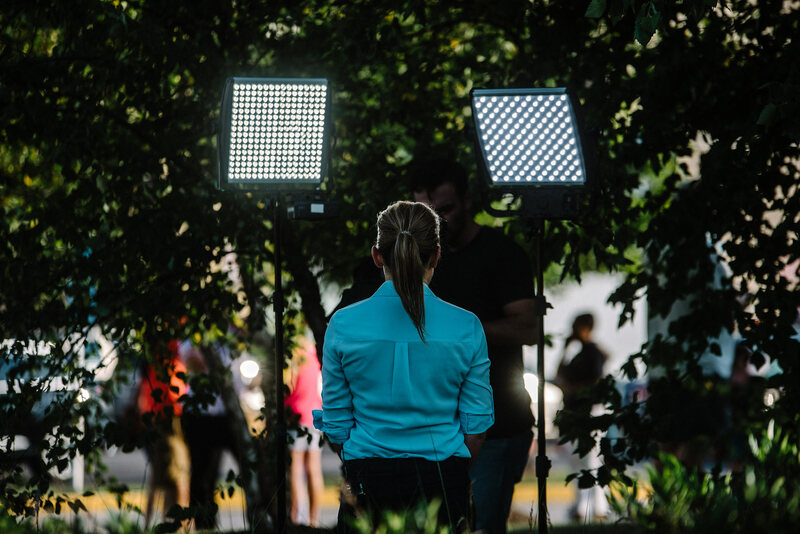 A TV journalist near the Capital Gazette in Annapolis, the day after the shooting. 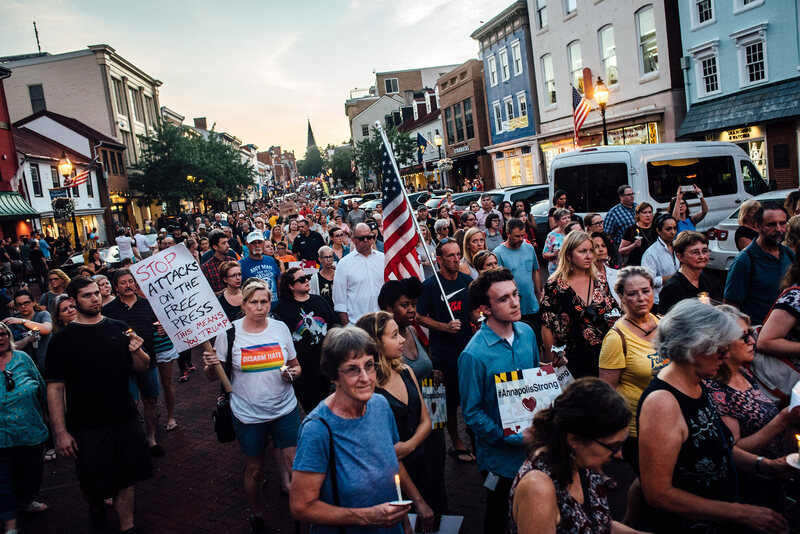 People walk on Main Street for a vigil held in the honor of the people killed at the Capital Gazette in Annapolis, Maryland. 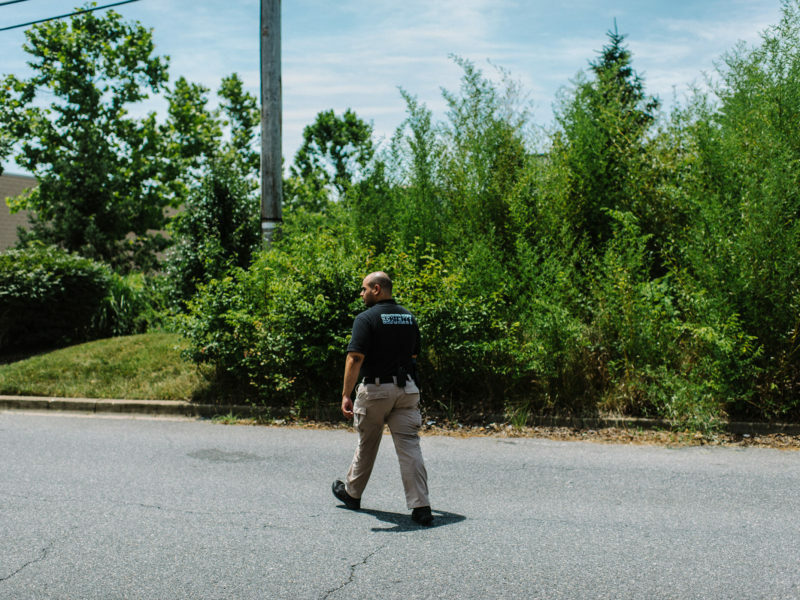 A security officer patrols the perimeter around the Capital Gazette. 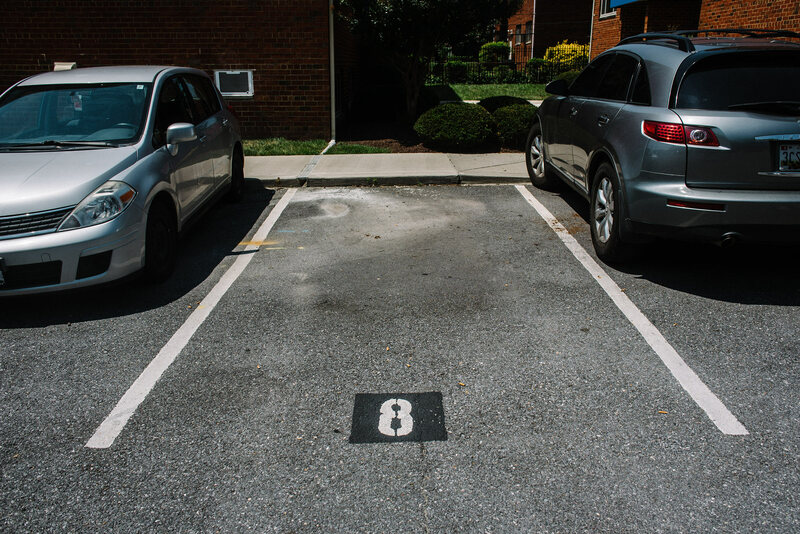 Jarrod Ramos' parking spot at his apartment in Laurel, Maryland. 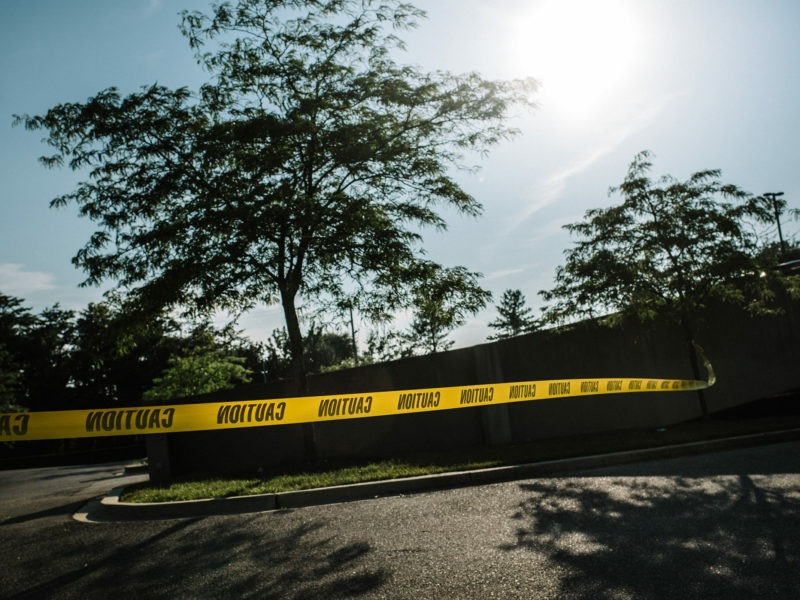 He killed five people at the Capital Gazette in Annapolis, Maryland. 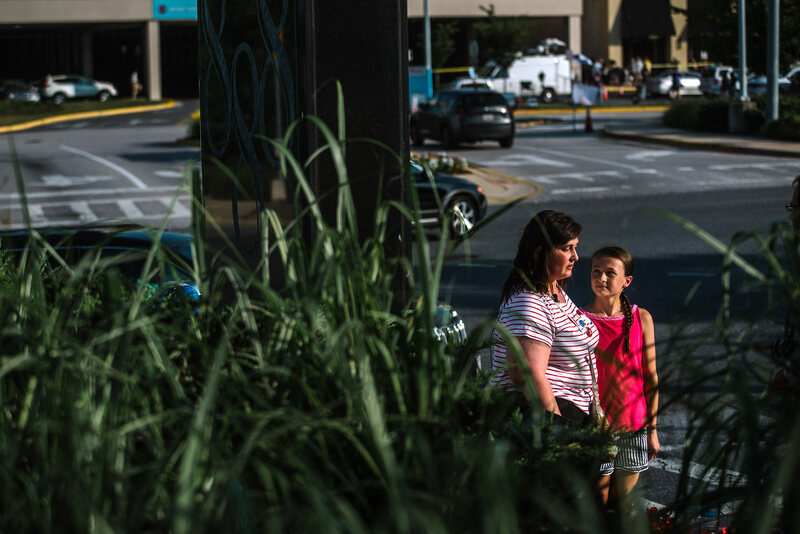 Erin Sutton, left, and her daughter, Emily Sutton, 12, right, give an interview in front of a memorial. 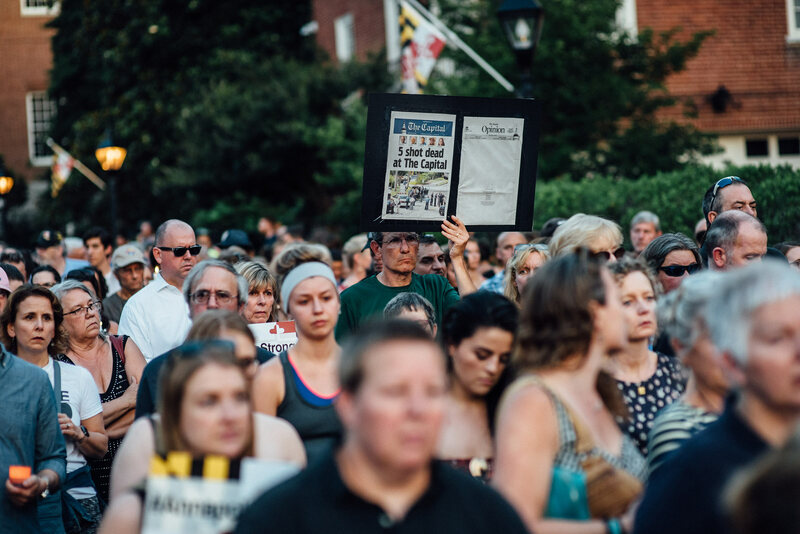 Mourners in front of the Capital Gazette. 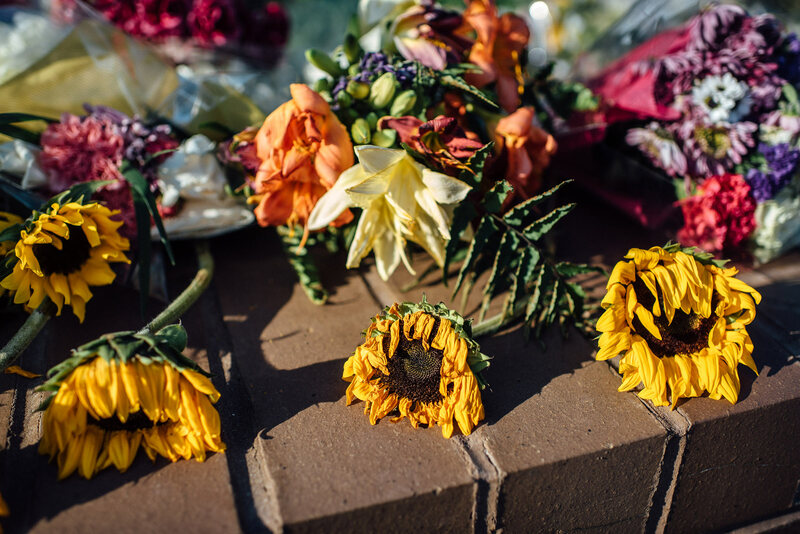 Wilted flowers at a memorial.